David Fravor is a recognizable type. Affable, neatly dressed, with a men’s regular haircut and semi-rimless glasses, he’s a retired military man who works as a consultant in the Boston area. He could be standing in front of you in a Starbucks line and you wouldn’t notice him at all. But the story he has to tell is literally out of this world. 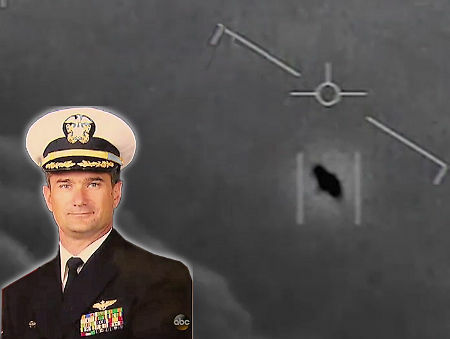 Thirteen years ago, the Windham, N.H., resident was a veteran US Navy pilot at the controls of an F/A-18-F fighter jet flying off San Diego when he sighted an unidentified flying object and tried to intercept it. “I want to join on it. I want to see how close I can get to it,” Fravor, 53, said, describing his thinking as he began the pursuit. Then the object, which looked like a 4o-foot-long Tic Tac candy, “goes whoosh, and it’s gone.” he said. It accelerated rapidly and disappeared like no aircraft he had ever seen in his career. If an organism can cross the distance between stars, even if it's just from the Centauri system, and they have been here for three generations and meant to wipe us out, we'd be gone. Fumigating this planet from space for social monkeys would be simple for them. So, if they are here, it can only be to help us or, if they have their own morality or there is actually 'interstellar law' of a galactic civilization of some sort, to wait for just two more Human generations until our own behavior wipes us out and they can claim and colonize an 'empty' planet. The idea that an organism can be self-cannibalistic as we are and still become 'advanced' enough for interstellar travel is absurd and we are the proof, so the odds are, if they exist, they don't mean 'harm'. We'll take care of that part all by ourselves.